Fun Depot’s mission is to deliver a fun, unique, and memorable family experience through high quality service and constant innovation. Fun Depot commits to providing a safe, clean, and wholesome family environment. We will strive to create a workforce based on ethical values, equal opportunity, and the future aspirations of our employees. We also recognize our responsibility to the surrounding community and pledge our support to local social and charitable endeavors. The Fun Depot that hundreds of customers enjoy and approximately forty employees operate today is actually the result of many years of perseverance and vision. Most people know that it is a family business fueled by dedication, hard work, laughter, and a lot of heart. But what most people do not know is how this business came to be the success that it is. In 1984 the founder bought the property where he would later build Fun Depot. His plans for this property were not for a large arcade complex but instead an office park. However the poor condition of the real estate at the time led him to rethink his initial design for his business. He began to brainstorm about something that would really spark the interest of the community, and also something that he could do well. His solution was a family entertainment center. After moving his family from Connecticut to West Palm Beach in 1988, they opened up a small arcade in one of the stores outside of the property he owned. During this beginning phase he worked in the arcade alone with the support of his wife and children. From 1988 to 1992 he struggled to make the arcade successful and lucrative enough to continue on with his plans for a much larger and more elaborate family entertainment center. At this time his wife continued to support her husband as she tried to develop her own business: a store on the same strip mall where she sold dresses from her home country of Brazil. But she decided to give up her store due to various robberies, and joined her husband in his dream to build his arcade. The family’s plans started to gain momentum with the addition of a go-kart track, built in 1992. The following year they continued to expand the business by adding batting cages. Finally in 1996 they started to build the facility that would later hold hundreds of arcade games. The next year the building was ready, and Fun Depot started to reap the reward for their years of hard work. Business flourished. Then in 2001 they continued to grow the business by knocking out the western wall of the building and adding space for a café, more arcade games, a kid play zone, and a Laser Storm arena. Since then the staff has seen a steady increase in clientele and the addition of a virtual roller coaster and rock wall. Every year brings new forms of entertainment and new customers. Future plans include a miniature golf course and much more. In 2014 Fun Depot renovated their Laser Storm Arena. Built in 2001 and over 10 years old it was time for a refresh. Partnering with an awesome themeing company we designed and built a new technologically advanced arena. The new arena paired with brand new amazing Laserforce equipment makes for a seriously good time. 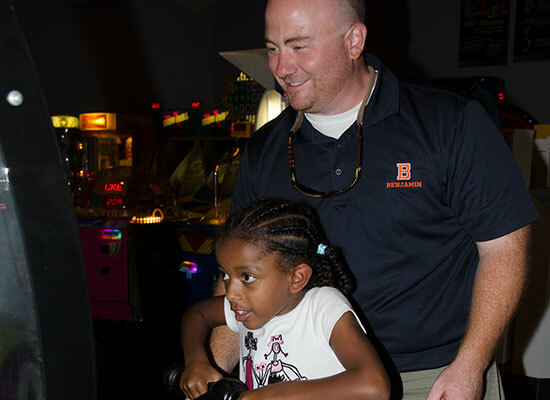 Now with memberships, the ability to level up, new weapons, and awesome team based and elimination games Laser Tag at Fun Depot is set to be one of West Palm Beach’s premiere attractions for years to come. The history of Fun Depot has been a succession of big ideas, continual progress and lucrative results. The next generation, accompanied by a fabulous staff, is eager and excited to experience the accelerating ride that is Fun Depot.